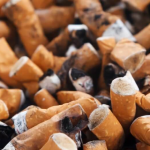 The risk of developing lung cancer drops dramatically five-years after quitting smoking. Researchers followed nearly 9,000 people for 25 to 34-years– 284 of which were diagnosed with lung cancer, and 93% of those were heavy smokers. They found five-years after quitting, former heavy smokers saw their lung cancer risk decline by 39% compared to current smokers. And the lung cancer risk continued to decline as time went on after quitting.